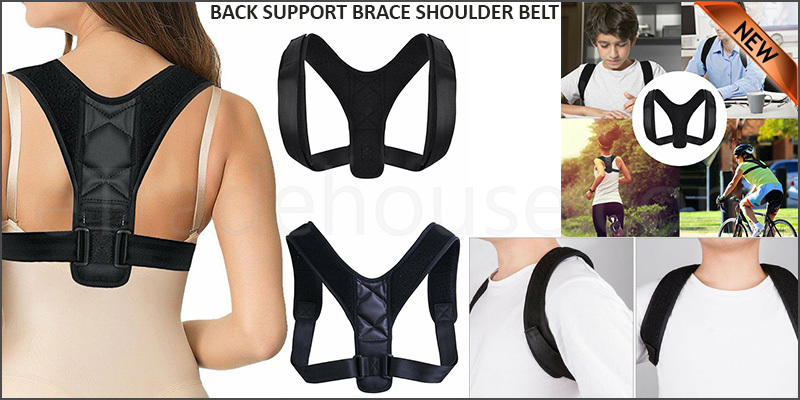 The Posture Corrector Back Shoulder Support Pull back your Upper Back to the right position. And then improve your whole body posture during work or life. It is Designed to Reduce pressure on spine and upper back pains. Train Muscle Memory: Poor posture has developed over a number of years and can contribute to conditions such as neck or shoulder pain, backaches, Osteoporosis, Scoliosis, slumped shoulders, and slouching. This posture trainer retrains your body to assume the correct posture. Correct Posture: Straighten up posture aid comfortably pulls your shoulders back to train your spinal alignment for posture improvement over time when used properly. If you are sitting all day at work or the office, you risk permanent damage to your back without spinal realignment. Train your posture with this slouch solution to improve your overall spinal health. Reduce Pain: Designed to Reduces pressure on spine and upper back pains. Correct sloughing and bad posture. Treats neck pain, Lessens Tension Headaches and Reduces Forward Head Syndrome. Front Loading for Ease & Comfort - Posture Corrector is easy to put on or remove, as well as comfortable to wear. Stays hidden under your shirt or blouse while providing you with maximum shoulder back posture support. Premium Quality Postural Restoration: Featuring strong but lightweight breathable materials and a cutting-edge front loading design means you will stay cool while promoting proper posture. This Posture Corrector should be worn daily for one hour, twice a day at first. Once your back or shoulders adjust to your new muscle memory improving posture, add 15 to 30 minutes more per session. Of course, avoid wearing posture correctors for extended periods of time as it should only be used to fix posture rather than provide permanent support. Adjustable Strap: Fully Adjustable to fit your level of compression. Adjustable Size: One size fits most men, women, children. Fit for Chest Circumference: 70 CM ~ 120 CM.